During the post-World War II years, the USA spent a great deal of money and manpower to help our former enemies rebuild their economies. One of these projects in Japan was the re-establishment of ceramics production. While Japan had a centuries-old tradition of ceramics (stoneware, china, porcelain) ranging from functional to decorative before the war, many of the factories were damaged during the fighting and skilled workers were in short supply. At war’s end, former factory workers and artisans found their way home and began to take up their jobs in the ceramics industry. At first Americans back home were reluctant to buy products from Japan. The main outlet for them was the PX, or post exchange: the store on the base where military personnel and their families shopped. Obviously our GIs felt that helping the Japanese rebuild their economies included being their customers. By about 1948 American ill will against the Japanese people had subsided enough that goods from Japan were once again welcomed in USA markets. Briefly, ceramics require two firings (baking in a super-hot oven called a kiln): the first, or bisque, firing that produces a solid, semi-porous object; followed by the glaze firing, in which a combination of minerals applied to the object and then heated become vitreous, thus rendering the object impervious to liquids. When shopping for Occupied Japan china, look for the identifying marks stamped on the bottom. Although there have been some forgeries, most objects carrying the Occupied Japan stamp tend to be genuine. On the other hand, some Occupied Japan china is, unfortunately, not marked as such, and requires a ceramics expert to correctly identify it. There are also some specific factory names you can look for: Ucagco is one of these. Other pieces are signed by the individual artisan. 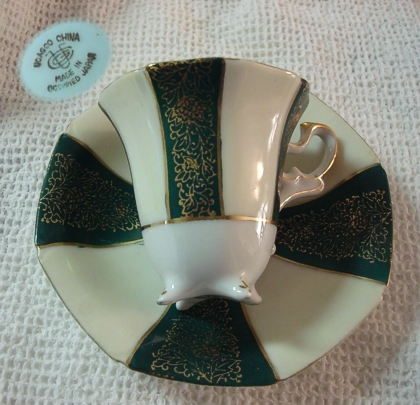 Occupied Japan china can be found at antiques and collectibles shops, yard sales, and via online sellers, and vary widely in price. Once you find a piece that you love, it’s up to you to decide whether the asking price is worth it.